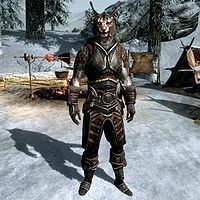 Dro'marash is a Khajiit warrior who follows Ahkari's trade caravan. He can be found walking the roads between Dawnstar and Riften, or camped outside either city. He is a common-level trainer in Speech. Dro'marash wears a full set of steel armor, including a pair of steel gauntlets (two variants), and a pair of steel boots (two variants). He is equipped with a steel sword and a steel shield, and carries a selection of common loot and gold.